From left, Harun Russell, Yusuf Peterkin, and Kenneth Boston gear up for a morning of trail clearing. "Gentlemen, everybody grab a tool," Brother Yusuf Burgess instructs the 15 teenagers gathered in a semicircle around him. We're standing in the parking lot of the Albany Pine Bush Preserve. It's the first Saturday in April, a warm harbinger of spring's renewal after a long, dreary winter in New York's capital. Some of the young recruits wear yellow T-shirts with albany boys outdoor leadership team emblazoned across the front. The boys clutch tree loppers and pruning saws as Burgess delivers the day's orders. "We're here today to do some trail grooming for our friends at Pine Bush," he says. "Once you get the tools in your hands, that's when the playing stops." Although he's old enough to be their grandfather, Burgess, a wiry 60-year-old African American, has no trouble matching the teens enthusiasm. His expressive face is framed by a blue-and-red knit skullcap and a salt-and-pepper beard. His tone is avuncular, but when he talks, the kids listen closely. After a quick warning from a Pine Bush volunteer to check for ticks at day's end, Burgess leads the teens and a couple of adult assistants down a trail into the nature preserve. Traffic noise from a nearby highway slowly fades, replaced by the intermittent whisper of wind blowing through scrub. But Burgess knows he will never entirely silence the urban cacophony--especially for these African American youngsters, who come from neighborhoods scattered across Albany. 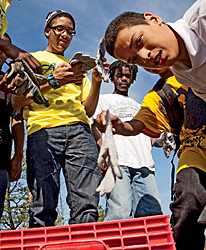 Getting kids outdoors these days is hard enough, he notes, but it's particularly true for the current generation of African Americans, who often define themselves--and have been portrayed by the larger culture--as an urban people. Since the Great Migration of the early 20th century, when millions of African Americans fled the rural South for opportunities in Northern and Midwestern factories, the outdoors has been something blacks have intentionally left behind, as a reminder of centuries of slavery and hard times. 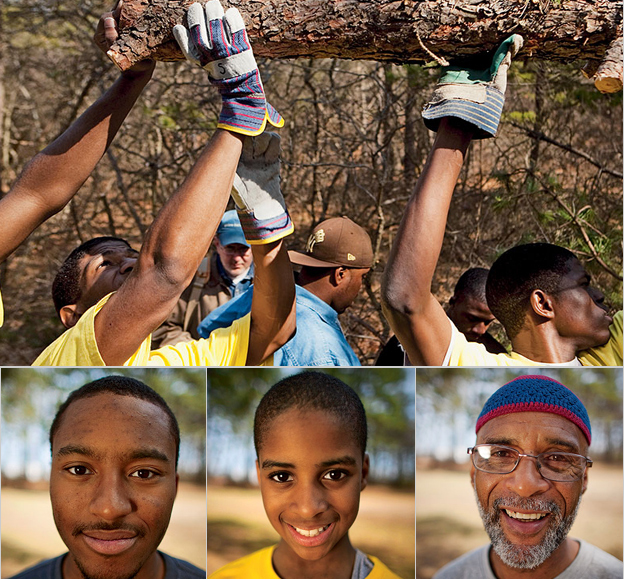 Clockwise, from top left: Derek Joseph (left), Jaimz Edwards (in brown hat), and Adham Stewart hoist a fallen pine; Burgess; Burgess's son Naim; and college student RaShawn Hoke. Joseph Burgess (his birth name) was raised in the Marcy projects in the Bedford-Stuyvesant section of Brooklyn, one of five sons. His brothers focused on sports: basketball, boxing, track. "I was like glee-club material," Burgess says. "It was rough." He found his escape in an unlikely place: the natural worldor what he could find of it near his home. He caught tadpoles and frogs in Brooklyns green-space oasis, Prospect Park, and explored undeveloped sections of 1,250-acre Flushing Meadows, later the site of the 1964 Worlds Fair. "I always liked going outdoors," he says, despite being teased by his peers as a child. Decades on, he's devoted himself to passing on his love of nature to new generations of African Americans, one youth at a time, often against steep odds. As the boys amble into the preserve, their raucous talk about basketball and rap and girls sputters out. The pine barrens will do that to people. They were formed at the end of the last Ice Age, some 15,000 years ago, when a melting glacier left a giant lake that stretched over much of the Hudson Valley. Through the centuries, the lake disappeared, depositing a thick carpet of sand across thousands of acres, the foundation of a vast pine barren. Today, the Pine Bush Preserve is one of the largest inland pine barrens in the world, covering 3,100 acres of rolling dunes a few miles from downtown. Blanketed with pitch pine, scrub oak, wild berries, and assorted grasses, the preserve shelters coyotes, white-tailed deer, porcupines, and great horned owls, as well as two endangered species: the Karner blue butterfly and the inland barrens buck moth. Earlier that morning at a local high school, Burgess had repeated what could be called his "prime directive." "You electronic guys!" he'd barked. "We're not going to be texting or phoning anyone. There's going to be nothing in your ear! You can leave 'em in the van or put 'em in your pocket. If your phones come out, you go out! All right? This is a day of listening to the outdoors!" Or as Burgess prefers to put it, today is for "Xbox detox." From left: Khalil Stewart reaches high; Maurice Bevelle, Derek Joseph, and Adham Stewart chuck a log; Kenneth Boston gets snippy. For more than 20 years, Burgess has provided many Albany and Brooklyn teens with their first opportunity to experience nearby wilderness areas. Part naturalist, part counselor, part community organizer, part surrogate father, he has helped to send hundreds of kids--most from low-income, single-parent, inner-city homes--hiking across the high peaks of the Adirondacks, sailing on the Hudson River on the famous sloop Clearwater, skiing and snowboarding down the Catskills, and rafting on the Ausable River. "He's taken a passion and transformed it into something useful and transforming for the kids he deals with," says Keyon Young, executive director of the Boys & Girls Clubs of Albany. "And he has a phenomenal rapport with kids." The morning grows warmer as the group moves deeper into Pine Bush. Everyone feels grateful for the sun. Before long, the boys unshoulder their tools and get to work, snipping and trimming the undergrowth flanking the trail. A few hundred yards in, they find their way blocked by a 30-foot pine tree downed across the trail. Without being told, seven or so boys swarm around the fallen tree. You can practically smell the youthful testosterone hanging in the air as they attack the pine with their hand tools like ants devouring a fallen Popsicle. "Don't let it happen--make it happen," Burgess exhorts. "Cut off the small branches first, so you can see what you're doing. Isiah, you gotta eat your Wheaties!" Within minutes, the fallen pine looks like a giant, knobby toothpick. Then, working together, they sever the trunk. A half-dozen boys grapple with the tree and heave it to one side of the trail, where it falls with a satisfying thunk! "All right," Burgess says. A couple of the boys echo him, before rambling down the trail. There are plenty of reasons why the current generation of American teens has grown so removed from the natural world, says Martin LeBlanc, the national youth education director for the Sierra Club. The culture as a whole has developed a fear of unpoliced wilderness. Kids have also grown accustomed to the constant, effortless electronic stimulation of video games, smart phones, and laptops. Many communities lack convenient or safe access to the outdoors, and many teens lead such overly scheduled lives that they have little free time to explore nature. For African American youths, there's another big obstacle. Simply put, nature isn't cool. "There's been a disconnect, big-time," Burgess says. "During the African diaspora--from Africa to Southern plantations to the Great Migration--the connection to nature has been broken. And it has left a nasty taste about being in nature for many black folks. It's that disconnect that we're trying to reconnect." That reconnection, Burgess maintains, can serve as a life-affirming alternative to the harmful temptations that can snare and forever derail young lives: school truancy, drug use, gangs. Burgess, who makes his living as a family-intervention specialist at Green Tech High Charter School in Albany, immerses kids in nature to break what he calls "the line from the school yard to the jail yard." "We do gang prevention, not gang intervention," he says. "I'll start in third grade with community gardening, bird-box building in the summer, eagle-watching in the winter in Harriman State Park. We don't leave 'em alone; we keep 'em moving. It's all about youth leading youth, with me and the other adults as their guides." "And it works, particularly when some school administrator calls up and says, 'I can see a real difference in Mr. Smith. He's really focusing,'" Burgess continues. "A lot of folks, including policemen, know my youngsters. They're called 'Yusuf's kids.' They know these are the kids who are doing something different." RaShawn Hoke is one of those kids. A doe-eyed 21-year-old with a wispy goatee, Hoke has joined the Pine Bush hike while on a visit home from college. But when Burgess first met him, Hoke was 13 and spiraling out of control at home and school, in danger of being lost to the streets. Burgess took a special interest in Hoke, enrolling him in summer-camp programs and taking him on overnight trips in the woods. Since then, Hoke has hiked, skied, sailed, and cleared trails--experiences that changed his life. "There's nothing like the view from the top of a mountain," he says. Today he is a junior at Barry University in Florida and considering a legal career. As the trail winds on, the stands of pitch pine surrender to scrub oak. A few blackened and scraggly pines--the survivors of the controlled burns that periodically sweep the barrens--stand like lonely sentries over the scrub. Burgess knows firsthand that nature can heal all sorts of wounds. In the 1960s, he came home from an extended army tour in Vietnam suffering from post-traumatic stress disorder. He was angry, depressed, and unable to readjust to civilian life. A Veterans Affairs counselor recommended Burgess attempt to heal himself by trying an outdoor activity, like kayaking down the Mohawk River. "The river made me whole again," he says. "And that made me realize that it was OK to know the names of all the trees and flowers." Burgess converted to Islam in 1976 and changed his name. He became known as Brother Yusuf around his Brooklyn mosque, a handle that came with him when he arrived in Albany in 1991. The sandy terrain begins to flatten out as our hike through Pine Bush nears its end. It's almost noon, but Burgess has more activities planned. They pile back into their vehicles for a short drive to Six Mile Waterworks, a public park and reservoir owned by the city of Albany. A few days earlier, Burgess and some Green Tech High students had helped a Department of Conservation team stock the reservoir with thousands of fingerling trout. In a few weeks, he will be leading an overnight camping trip upstate to the Ausable River, and he wants the boys to practice pitching tents. "Gentlemen, now that weve got 'em up, let's take 'em down," Burgess says. Their day is almost over. Besides, he has packing to do when he gets home. He's leaving for Australia in a week to attend an international conference of nature and cultural interpreters representing some 40 countries. While there, he'll present a workshop on reconnecting urban youth to nature. He's excited by the prospect of snorkeling on the Great Barrier Reef, visiting the outback, and maybe getting in some kayaking. "For a kid raised in the Brooklyn projects, this is just an unbelievable opportunity," he says. Nearby, Burgess's young charges are folding tents, stashing tools, and activating cell phones. Several start texting. Burgess makes no move to shut them down. He's a realist: He knows that today's Xbox detox was only one of many steps for these kids--that the quiet thrill they found in the pine barrens will soon be drowned out by the urban bustle. But he also knows in his bones that Pine Bush has been planted in their memories like a seed, and that at least some of them will find their way back. Mark Frankel is a writer and editor living in Hastings-on-Hudson, New York. This article was funded by the Sierra Club's Building Bridges to the Outdoors program, whose goal is to give every child in the United States an outdoor experience.